Let’s be honest, spending time in the office isn’t always the most fun part of the day. Looking for some fun trivia to impress your co-workers around the watercooler? 1. Astronauts use pencils in space. The pencil isn’t just for taking tests in school. In fact, astronauts count this simple tool as one of their essentials for a trip to the moon. Why is the pencil so special? Because it can write just as effectively whether it’s upside down or in zero gravity. 2. Revive old permanent markers with alcohol. When you think your favorite green Sharpie is finally dried up, don’t throw it in the trash just yet. You can revive old permanent markers with a little bit of rubbing alcohol. 3. How many Post-It notes would it take to circle the world? The days of being limited to the standard, pale yellow Post-It note are gone. Now you can buy Post-It notes in virtually any color, pattern, or shape. Ever wonder how many of these brightly colored papers it would take to circle the whole world? 4. You can use aluminum foil to sharpen scissors. Normally, you keep aluminum foil in the kitchen. But if you’re in a pinch, you can bring this thin sheet of metal into the office to sharpen scissors. Simply cut into a piece of foil and you’ll clean the scissor’s blades by removing small bits of rust and burrs. 5. 85% of highlighters sold are yellow. Like the Post-It note, the highlighter has evolved from its traditional yellow hue to an entire rainbow of options. But 85% of highlighter sales are still the classic yellow. Why is this fluorescent shade so popular? Because it is in the middle of the visible spectrum of light, making it the easiest shade for color-blind people to read. 6. The legal pad was created in the 1900s. Despite laptops and smartphones and tablets, a lot of people are happy to stick with the good, old legal pad. This style of pad (now standard issue) was first created in the 1900s when a judge requested that a left margin be drawn on all of his papers. The reason for his request is unknown but, clearly, the judge’s preference caught on as this is now the standard model for all legal pads. 7. King Louis XV was the first to use a stapler. The stapler may not seem like a particularly glamorous invention, but in the 18th century it certainly was! At this time, the king of France, King Louis XV, was the first to use a stapler to bind his royal papers. Allegedly, each staple bore the insignia of the royal court and was made out of solid gold and encrusted with precious stones. 8. In a race to the moon, the pencil would beat the pen. We already know that astronauts choose to bring pencils to the moon. But here’s another fun pencil fact: if the pencil had to race the pen to Earth’s natural satellite it would win, hands down. The moon is approximately 238,855 miles away from Earth. A classic ballpoint pen contains enough ink to write for 2 miles. This means that it would take 477,710 pens to draw a line straight to the moon. Your average pencil, on the other hand, contains enough graphite to write for 35 miles, so you could draw a line to the moon using only 6,825 pencils. 9. Scissors were invented by the Egyptians in 1500 B.C.E. As far as office supplies go, scissors are probably the most ancient. The Egyptians created this nifty tool in 1500 B.C. by fastening two bronze blades together with a metal strap. The scissors next fell into the hands of the Romans via trade in 100 A.D. It was them who upgraded the design to the cross-blade style we use today. 10. The Post-It note was invented by accident. Almost everybody keeps a stack of Post-Its on their desk, but this standard office supply was a happy accident. In 1968, Spencer Silver was working to create a super strong adhesive. He failed. What he created instead was a weak adhesive that left behind no residue. It was not until three years later that Silver’s accidental invention was put to proper use. Arthur Frye, a colleague of Silver’s, was studying a choir hymnal and using small pieces of paper to mark the pages. The pieces of paper kept falling out of the book, until Frye thought to use Silver’s weak adhesive to make them stick: the first Post-It note. 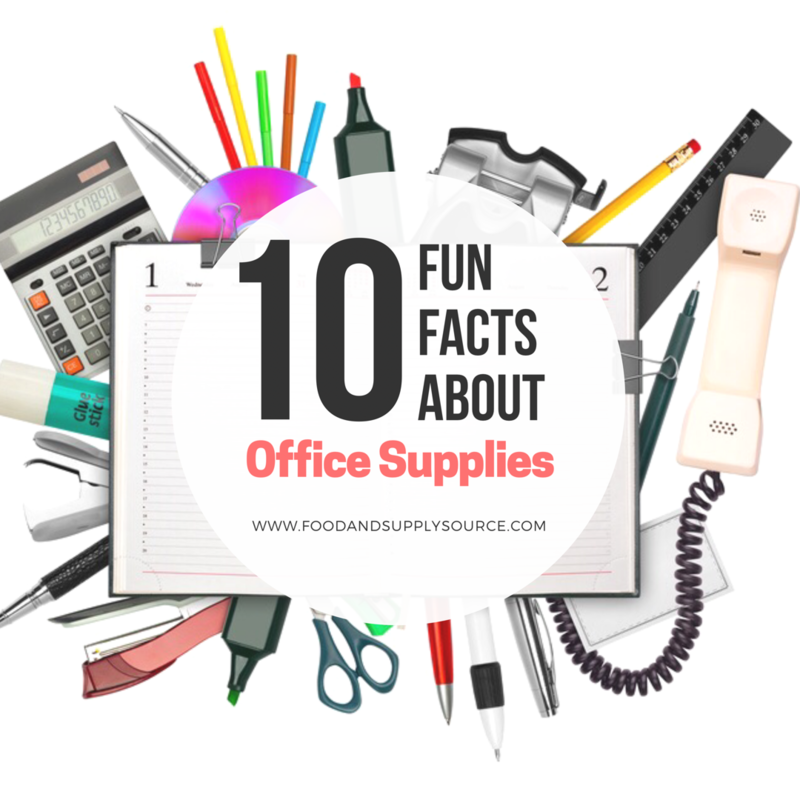 Now that you know that the stapler is an 18th century French invention, are you ready to stock up on supplies for the office? At Food and Supply Source, you may not find a solid gold stapler, but you’ll definitely find all the supplies you need at a convenient, affordable price. Save 30% on Office Supplies every time you order. Customers who sign up for a Staples Advantage account through our link will have access to the discounts. No cost to sign up. No obligation. Already a member? Sign in and place an Order Now.